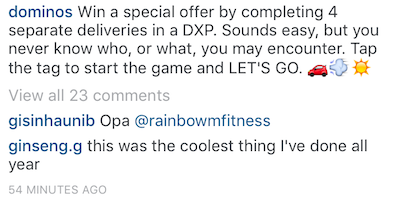 As part of the unveiling of the ultimate pizza delivery vehicle, my partner Craig Bishop and I created a unique gaming experience on Instagram for our pizza fanatics. We posted two organic posts throughout the week of the launch, and from the starter posts, tags directed you through four levels where different puzzles and characters were met. Upon completion of all four levels, our fans received a four digit code for 20% off their order. After the launch of our game, Instagram followers dramatically increased as well as traffic to the DXP website. Play the game on Instagram here or here.